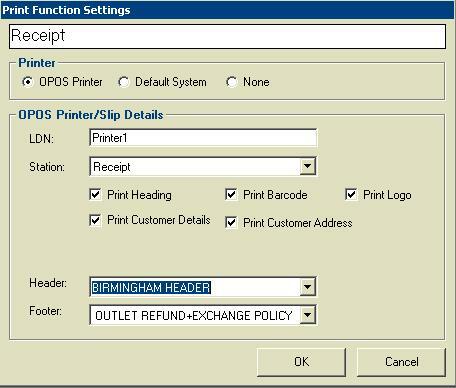 Setting up receipt headers and footers for till receipt printouts is a two stage process. First you must create receipt textblocks to use as a header or footer, and secondly you need to assign the specific text blocks you have created to the required till pint functions. 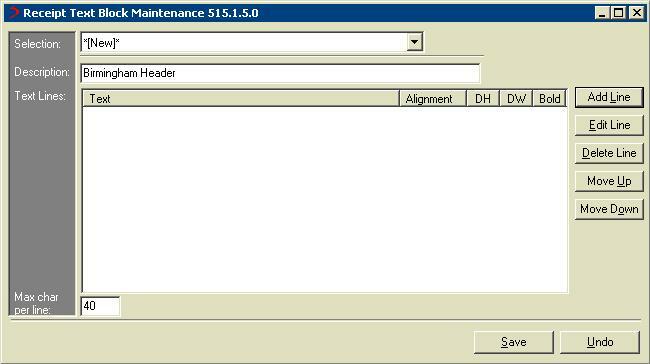 To set up a text block launch the text block maintenance module from the PoS Administration->Receipt Text Blocks menu option. Enter a unique description and use the edit controls on the right to add,edit and arrange lines of text as required. (NOTE most receipt printers only allow 40 characters of text per line - 20 if double width is used). Once all required text has been entered click save and the new text block will be created in the database. 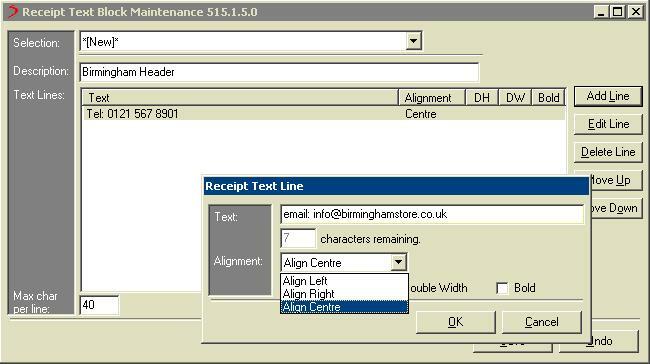 The next stage is to assign the created text block to the desired till print functions. 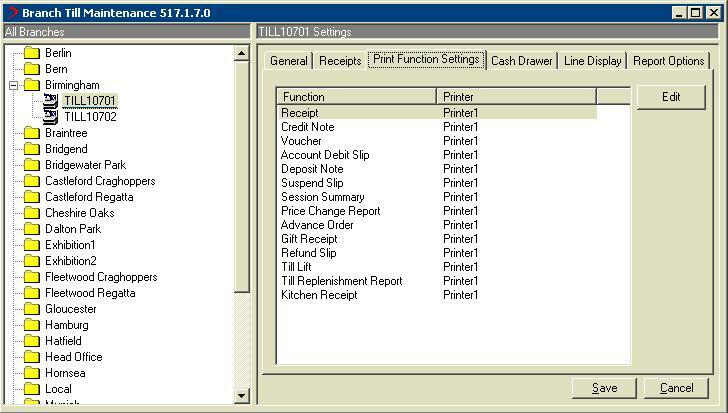 To do this launch the Till Settings module from the Pos Administration->Till Settings menu option. 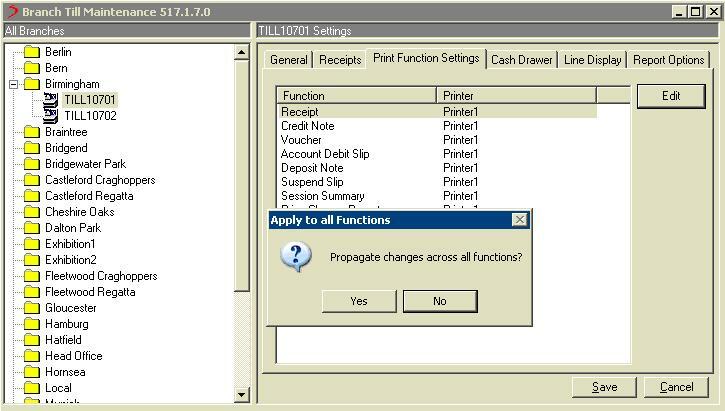 Select the required till from the list on the left then select the 'Print Function Settings' tab on the right. Highlight the function you wish to set the header or footer for and click 'Edit'. A new window will be displayed detailing the settings for that particular print function. Set the dropdown lists for the header and footer as required, picking the required text block in each instance then click OK.
You will then be presented with a dialogue box which asks if you wish to progagate changes accros all functions. If you wish all print functions to be set the same select yes, alternatively if you wish to use different text blocks on different types of printouts then select no and edit each function as required individually. Finally click 'Save' to commit your changes to the database.